When we meet young Adonis Johnson, he is just a troubled child with a fighters heart. A heart he got from a father he never met. That heart compels him to leave everything he has ever known behind to become the worthy successor to his late fathers legacy. The themes of legacy and family run deep in this film as Adonis struggles to be his own man while reconciling with the fact that he is also a Creed. The obvious choice to help him on this journey is Rocky Balboa who must pass the the torch as the series hero to the young fighter. This movie is expertly crafted by writer/director Ryan Coogler. It pays homage to the original Rocky series while still standing on its own as a character driven drama about two people who find one another, become family and teach eachother what it means to fight, both in the ring and in life as well. The soundtrack hits every emotional beat needed to send ones heart soaring as the audience is taken on this rollercoaster ride. Sylvester Stallone and Micheal B. Jordan both give stellar performances and are backed up by an amazing supporting cast which includes Phylicia Rashad, and Tessa Thompson. 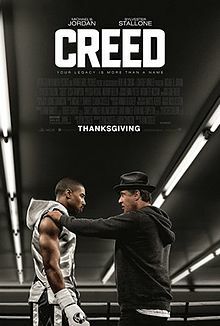 If you are a Rocky fan or just want to see an emotionally impactful and well made film, find Creed at your local cinema. This entry was posted in Movies, reviews and tagged acting, boxing, movies, Rocky, sports. Bookmark the permalink.